Renovating a kitchen can be a daunting task. It becomes even more challenging with today’s trend towards opening the kitchen to the rest of your home via a kitchen island and incorporating it as part of the living and entertaining spaces. Designing the kitchen to become part of the dining and possibly the living areas can generate great flow and continuity. The area becomes more spacious and may now accommodate a crowd without cutting people off from each other because of separating walls and rooms that were just too small before. It can also mean an intimidating renovation project that requires you to make a lot of big decisions about the size, style and design of the island counter as it fits with several rooms rather than just in the kitchen. In addition, kitchen cabinets can take on a more prominent role in the design. Indeed, they do. You may want to upgrade to a more elegant style that complements the dining or living room. You may also be able to add new cabinets under the island, increasing storage, of course, but also offering an opportunity of visual bridging space between the kitchen and newly opened area. 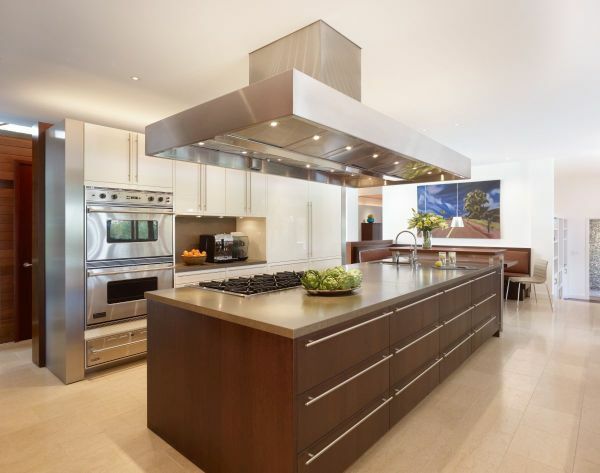 Cabinets under the island can act as transitional space, drawing the eye in to the adjacent rooms. In this role to draw the eye into the entertainment area, you may choose contrasting cabinets—in color or design, or both—to the ones hanging in the kitchen area proper. 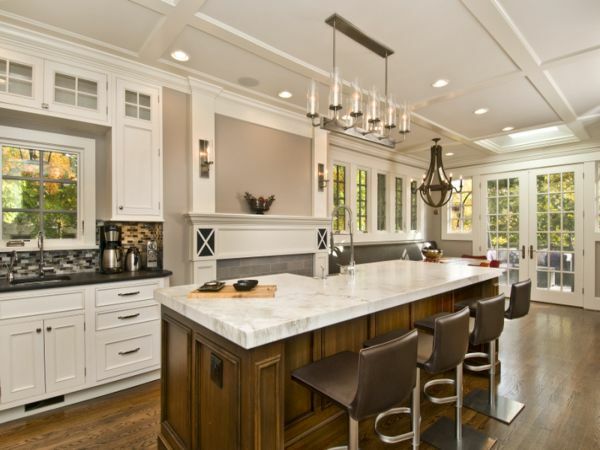 That makes the choice of cabinets under the island critical to the success of the renovation. So it can get complicated. The choices of kitchen island design and materials and the cabinetry must work together as a unit in the kitchen but also through that space and beyond into the living and dining rooms. When you consider the new space, remember that you want it to work with what you already have. In some cases, that may mean custom design cabinets are the only way to go to fit with both the kitchen and new, open space. Or, you may get lucky and be able to use wholesale cabinets, a more affordable option for most of us. They can be partially customized, for example, by replacing the stock issue doors with ones that have glass or other options as they suit your space. As much as a kitchen island reconfigures the physical footprint of your home, it also dramatically changes the way the people respond to the space. If you have opened a wall (or two) to create your island, it will become the hub and heart of the home, and people will naturally converge there. This is an important consideration as you plan your space. Kitchen islands are inherently casual yet intimate spaces. Even countered with marvelous marble, a kitchen island insists on informality and invites shared activity. So once installed, you may find you use that space in ways you had not expected. For example, your kids may sit at the island to do their homework or chat there (for hours). You may find yourself watching the television in the living room while you prepare dinner in the kitchen. Well, and why not? When friends drop by, you may sit at the island while they relax in the living area. The separate nature of informal and formalized space falls away when the walls come down. Boundaries blur and merge in this design space. Naturally, then, so do activities and function. The same holds true for the kitchen cabinets. They no longer serve just as storage units that can be ignored as long as they do their job because no one notices them in the kitchen. They become potential objects of beauty and significant pieces of furniture that can accent more than one living space. And indeed, they must, with this new living arrangement. The kitchen island offers a novel configuration of home design and purpose, one that opens space and creates a multifunctional hub in homes formerly separated by walls and doors. That makes sense, and homes that have kitchen islands seem like wide open spaces with endless possibilities of form and function. How to reface cabinets in kitchen?